Two and a Half Canadians in Cambridge: Menu Planning and Groceries. Le Sigh. which is the size of a Mac's store but is a mini-supermarket, including fresh meat & poultry, fresh fruit & vegetables, and the most important: wine & beer. And while they are a little bit more expensive than at the larger chains (Tesco's, Sainsbury's or Asda), the price difference is still way less than bus fare (£3.40) and the convenience factor is huge, considering there are two within 5 min walking distance of my house. So I have been picking up fresh fruit & veg and whatever we want for dinner every afternoon, since we don't have a freezer. That is right. It is so hard to live without a freezer. You can't buy more than 2 days worth of meat (and all you vegetarians can start patting yourselves on the back for not having that problem), and you can't pre-make baby food for your baby, and you can't have ice cream. I know. Regardless, I thought I'd challenge myself this week and do an online grocery shop, and have my groceries delivered (!!!) as suggested by my cousin Emma. Asda is the equivalent of Walmart, and even has the George clothing line. And they bring everything right to your front door, at a time slot of your choosing, the next day. And it only costs £3.50, so basically the same as the bus but without the hassle of bus+stroller+baby+groceries - and even though I am an excellent sherpa now, it is still really exhausting. And then, for some reason, I thought it would be good to buy food that I had never bought before. Like parsnips. 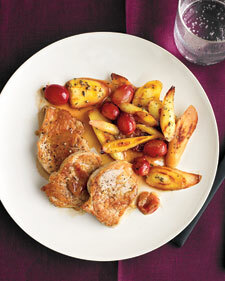 I have never purchased parsnips, but this week, we were going to have pork chops with parsnips and grapes. (I can't get the photo to be underneath this sentence, sorry, it has to be above the paragraph. How frustrating.) Elizabeth has been really keen on soups lately, so I thought I'd make some potato leek soup with bacon - big thanks to Chrissy & Dave for giving me inspiration towards soup. Fine. I had made a little menu - full of food that we never eat. Well done me. Then came the ordering. Yikes. Everything is by weight, whereas recipes are # of items. Example: 3 small parsnips... how many kg are 3 small parsnips? And when you order on www.asda.com, there's no option button to dictate the size of your parsnips. As a result, I ordered 1 kg of parsnips, 1.5 kg of broccoli, and .50 kg of mushrooms. The parsnips were GARGANTUAN, easily three times as big as any parsnip I'd ever seen (which were the ones in the photo above), and 1.5 kg of broccoli is an awful lot of broccoli. After the order arrived, I looked at the broccoli recipe again, and realized I usually halve it. Whoopsies. And for your information, 0.5 kg of mushrooms is about 0.4 kg more than I have ever bought in one shop. This is what 1.5 kg of broccoli looks like - aka a full grocery bag. This is how huge our parsnips were - I used the coffee maker for size comparison. British eggs are stamped! Each one! How weird! In the middle of my online shop, I had to make an emergency phone call to my Nanny: what kind of potatoes do you buy for soup? In Canadian grocery stores, I think I saw maybe 4 types of potatoes: yukon gold (yum), russet (hard to peel), baby new potatoes (yum!!) and then the random loose ones that always look really dry, and I never buy. On asda.com, there are all kinds of potatoes I had never heard of: King Edward, Charlotte, Maris, Marabel, Marilyn, Roasting Rudolph - whaaaaat??? I wish I was making this up. So I phoned Nanny, who took the question very seriously, and we had about a ten minute conversation about potatoes. She recommended King Edwards. When I laughed and said, "obviously, those are the most expensive potatoes out of a selection of about 25 potatoes", she said (quite seriously), "well, Georgie, they are a very old potato, and the nicest potato, I think." These potatoes are probably going to change my life. I cannot wait. And thank goodness for that, because we have enough to last for a really long time. The best moment of this online shopping experience is is that I still had to go to the corner store the same day anyways. I had forgotten some key items: milk, bread, butter and coffee. Still have a few things to learn about menu planning, I guess. A learning experience! I had no idea about the range of potatoes, by the way. You wouldn't want to refer to "Roasting Rudolph" near Christmas. Not in Canada, at least. Your coffee maker looks like a sweet Transformers mask in that picture. Hi Georgina. I am loving your blog. So funny. This post - especially the part about the potatoes made me laugh out loud. Anyways, I hope you are doing well and look forward to hearing more about your adventures!